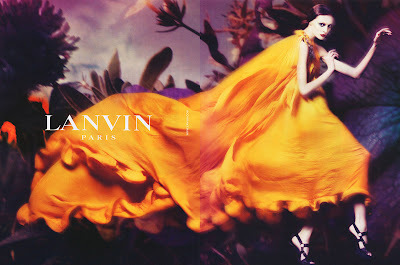 I just arrived in 43° Perth, West Australia after crossing the scorching Nullarbor Desert and swooned when I caught sight of this shot from Lanvin's spring campaign. I love how Olga's dress dances like a fabric flame across the dark foliage behind her. Strangely, this image reminds me of the vivid purple/gold sunsets I saw in the desert these last few evenings. Please go to flickr for a few photos taken while on the longest stretch of straight train track in the world. Posted by la femme at 11:58 p.m.
you're almost off to india!! Wow. That is a wonderful shot. Truly inspiring. Would you be interested in exchanging links? by the way i love your blog. the ad has made everybody talk about it. Merci et à bientôt !!!!!! Not too bad...I'm not a huge fan (no pun intended ;)) of models that look like they haven't eaten in 6 weeks. No offence. I think the picture is great, but the model puts me off a little. Love the use of colour. It’s all about fantasy and fantasizing which is an element that could be very important today…just to get what is happening today you probably have to be more free in spirit. and that you saw it in perth! hope you enjoyed your time there! Lanvin for men (just Lanvin) is one of my favourites. It's seldomly (sp?) advertised here.